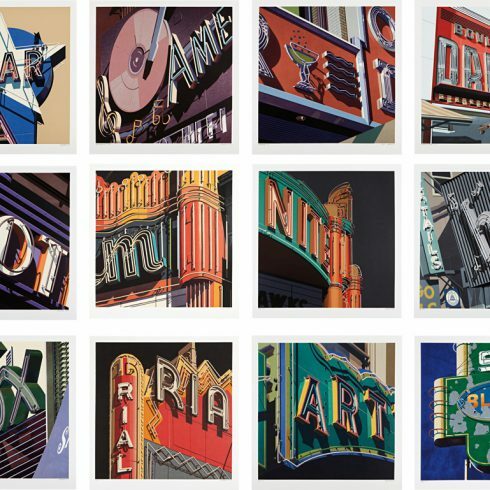 Robert Cottingham is an American artist known for his paintings and prints of urban American landscapes depicting building facades, neon signs, movie marquees and shop fronts. Although often considered one of the most important photorealist painters, Cottingham rejects the label of being a photorealist. Robert Cottingham was born in Brooklyn New York in 1935. 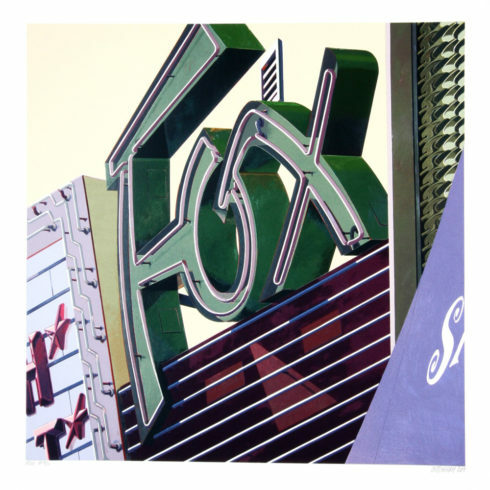 He is recognized for his original prints and paintings of urban American landscapes, signs, shop fronts and building facades. Robert Cottingham’s career in advertising was gravely influential on his artworks and his art is heavily influenced by the Pop Art movement. The artist lives and works in western Connecticut. 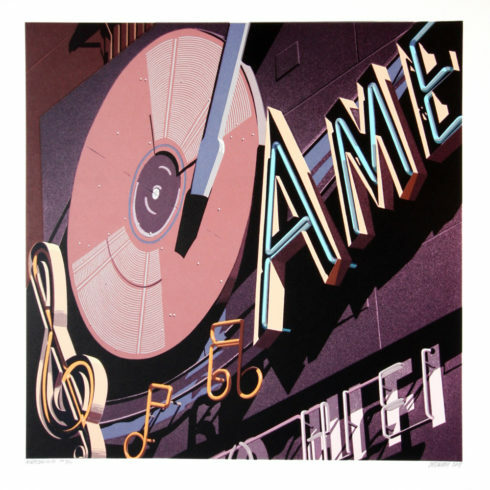 Our Fine Art Gallery has the finest quality Robert Cottingham original prints and screenprints from the American Signs portfolio for sale. We have a large inventory available off-site and we encourage you to make an appointment to see specific works you are looking to collect. We are happy to meet you at either our art gallery showroom or at your home or office for a private presentation. After serving in the U.S. Army from 1955 through 1958, Robert Cottingham studied advertising and graphic design at Pratt Institute in New York, graduating in 1963. Cottingham was then hired as an art director for the advertising firm Young and Rubicam, where he was involved with all aspects of design and production. Eager to advance his career as an artist, Cottingham eventually began to paint every day after work. In 1964, Cottingham relocated to Los Angeles for work. Inspired by the drastically different environment of the West Coast metropolis, Robert Cottingham began to commit seriously to his art. Many of Robert Cottingham’s paintings convey his interest in typography and lettering, as well as an awareness of the psychological impact of certain isolated words and letters. Utilizing techniques from advertising, Cottingham would crop and enlarge parts of vintage signs and marquees, producing words of enigmatic or comical resonance such as “Art,” “Hi,” or “Fox.” Cottingham’s enlarged sense of scale is reminiscent of James Rosenquist’s artwork, while his interest in text suggests the influence of Robert Indiana and Jasper Johns. In 1968, Cottingham ended his advertising career in order to devote all his time to painting. Cottingham’s first solo art exhibition took place at the Molly Barnes Gallery in Los Angeles in 1968. At this time Cottingham started using photography as an initial reference point for his painting process. After selecting a photograph, he translates it into black-and-white drawings by projecting the image onto gridded paper. Cottingham would finalize the process by projecting either the original slide or any of the drawings onto a canvas and organizing the composition according to a grid. Even though Cottingham is typically associated with Photorealism, he never considered himself a Photorealist. In general, Cottingham viewed his artworks as continuing the legacy of Pop artists such as Andy Warhol, who also had a background in advertising. 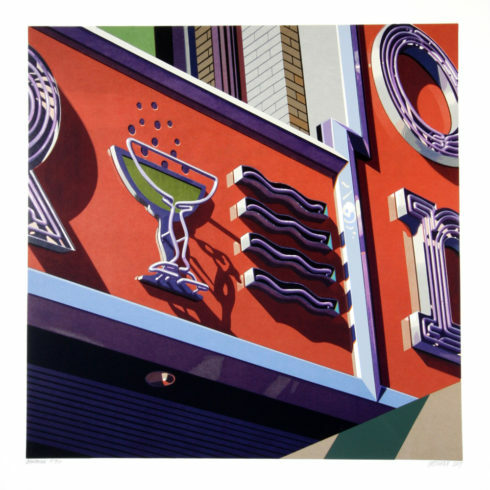 Even so, Robert Cottingham’s art often draws parallels to a number of American painters such as Stuart Davis, Charles Demuth, Edward Hopper, and Charles Sheeler. After living in London from 1972 to 1976, Cottingham found the city’s signs and history too foreign, and returned to the United States to settle in rural Connecticut. During the late 1970s and 1980s, Robert Cottingham’s urban cityscapes became more expansive, with more complex and broader views of storefronts, vistas, and entire neighborhoods. In the late 1980s and early 1990s, Cottingham expanded his iconography to include trains and railroad imagery. Robert Cottingham has taught at the Art Center College of Design in Los Angeles and the National Academy of Design in New York City. He was the artist in residence at Wesleyan University, Middletown, Connecticut from 1987–1992. Robert Cottingham’s art has been included in significant group exhibitions at galleries & museums all over the world. In 1978 he was included in a show at the Whitney Museum of American Art, New York; and a traveling exhibition at the National Museum of American Art (now Smithsonian American Art Museum), Washington, D.C. in 1986. A retrospective of Cottingham’s printed oeuvre was exhibited at the National Museum of American Art in 1998–99.